Extreame Savings Item! Save 41% on the FineDine Brushed Stainless Steel Double-Walled Ice Bucket with Lid, Compact Heavy-Duty Metal Ice Bucket with Handle and Wide Tapered Scoop for Half Gallon of Ice and Chilling Wine and Liquor Bottles. by FINEDINE at Verve Wine Bar. MPN: FD-858. Hurry! Limited time offer. Offer valid only while supplies last. Premium quality, brushed stainless steel ice bucket with scoop and lid holds up to a half gallon of ice. This small ice bucket not only ensures that ice lasts longer but brings an elegant touch to any tablescape perfect for parties, picnics, and romantic dinners. Double walled construction coupled with stainless steels temperature retention properties, preserves ice longer for hours of use. The ice bucket set is rust resistant and features smooth sides excellent for engraving; perfect to gift! An attached metal handle allows for a easy transport of the bar ice bucket. A bonus 9.75" inch solid stainless steel scoop with tapered tip makes retrieving ice from the wine cooling bucket simple.The scoop also features a convenient ring for wall hanging. Recessed, lid keeps a low profile, while the round handle protrudes for easy access. The interior of the small stainless steel ice bucket's lid features a rubber gasket for a leak resistant, mess-free closure that keeps air out and ice from melting. Our silver ice bucket can chill beer, wine, or liquor bottle. 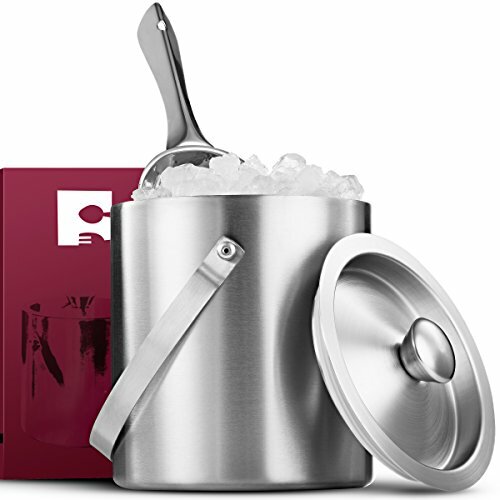 Use the metal bucket and scoop to add ice to cocktails, punch, juices, sodas, and water or for whiskey on the rocks.